I took a leave from work yesterday to finish personal errands. So my day went like this…. Then I headed to Land Transportation Office (LTO) to get my Student’s Permit. Globe did assist me so after they took my photo and signature I flew away. There were a lot of people outside ambushing you and saying they will process your license. So rule here Only talk to the Guards. Then I went to PNB for the SSS Loan. Then went straight to COMELEC in City Hall to check if my voter’s ID is ready. I want to have all my government issued IDs. Unfortunately they told me it’s ready but not available for release. I need to come back last week of June or first week of July. It was 2PM when I finished everything in my list and I am so hungry. My appointment with my OB is 4PM I still have more time to stroll. I crossed the elliptical road and went to Quezon City Memorial Circle Herbal Garden. I visited the All Organics Store ever since I watched the Bee Propolis Cream in Kapuso mo, Jessica Soho; I’ve been wanting to visit the store. I am so happy that finally I had time. I bought the cream, evening primrose oil, strawberry bearberry scrub, chocomint soap, and oatmeal & glutathione soap. I will try them and see the results before I post it in dishysammy. I went to Trinoma to have lunch. I ate at Tempura Japanese Grill alone. I had Katsudon Bento and California Maki. You know how much I love Japanese I do not mind eating alone. Food post here. After eating…. SHOPPING… I bought maxi dresses and cover ups for my upcoming Boracay vacation in June… I bought new office doll shoes as the building guard forbids me to enter the office. I proceed to The Medical City and wait for my OB and hopefully when I come back two weeks from now she’ll tell me the condition of my system. I met bf and he bought me a Bora bag, Since I am on a diet we did not ate and went straight home. I cannot imagined that I accomplished everything in one day. My driving class will start on Saturday. I am really excited. Oh well my best friend ask me to brainstorm possible makeup look she can wear to a wedding she’ll attend in June. I am killing time yesterday and here’s what I came up with. Apologies. I am still on my sleepwear and bed hair. Apply Makeup Base. I used Avon Solutions Refined White Makeup Base in Green. I like putting makeup base so that my foundation will last the whole day. Apply Foundation. I used Lola Masquerade Foundation Act II. I used a stippling brush to apply it. Apply concealer under your eyes, sides of your nose and mouth. I used Revlon Age Defying Spa Concealer in Light Medium. Apply eyelid primer. I used Elf Eye shadow Primer. Set everything with powder. I used Revlon Photoready Powder in Natural. You can use any loose powder you have. Let’s go the the eyes. I used the following on my eyes. I applied a matte baby pink from my Dollface 72 Vanity Palette first as base followed by the pink shimmer shade in my Revlon Custom Eyes 030 on my entire lid. I applied the purple from Revlon Custom Eyes 030 on my outer V bringing the color to my crease. I applied the same purple shadow on my lower lash line, only halfway. I used a matte white shadow to highlight my brow bone while cleaning harsh line from the purple. I applied a shimmer pink from my Dollface 48 Shimmer Palette to center of my lid, inner corners of my eyes, and to the other half of my lower lash line. I lined my upper lash line using a liquid eyeliner and lower water line with a brown eyeliner. I curled my lashes and put my demi lashes. Going back to the face. Contour – cheekbone, jaw line, temples, and nose using a matte bronzer. I used Bodyshop Matte Bronzer. Doing a fish face is best to contour your face correctly. Apply blush on the apples of your cheek. SMILE. I used Nichido Powder Blush in Tomato. Highlight. I used Elf Bronzer – Innocence. Apply Lipstick. I used SanSan Shimmer Lipstick 01 for the carnation pink color. I changed my lip color into fuchsia for variation. I used Revlon Lip Butter in Lollipop. What do guys think? Show me some love below. 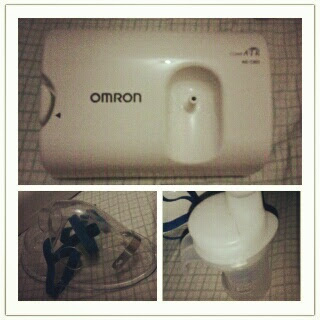 The doctor was out when I came at the Medical City Trinoma so for quick remedy for my asthma I bought my own nebulizer. I was using my niece's compressor but last week her mom took it. It started when I ate the toblerone overload by Cakes2go then the Chillz from Ministop. Here I am suffering from cough and mild attacks at night. I also have problems with my room because it has no ventilation and the dusts, add the extreme climate change in the Metro and I am so dead. I am also sad because I still wasn't able to up dishysammy, I need to mail my report and my work station will be replaced by a new unit (files and apps will be reinstalled). I am still positive so I am hoping to get well and to keep on blogging. I am thinking of a look for my best friend she'll be attending a wedding in June. Any ideas not to overpower the bride? I haven’t updated my personal blog lately. I am looking for an android app for blogger and sad to say the app is not available in the Philippines. I downloaded Blogger droid but I was scared when the ‘about’ said that some part of the site might not be encrypted. I was also too lazy to start up our laptop when I get home every night. This what made my week. Very rewarding feedback after I got back in blogging a month ago. I have been posting my food trip every now and then. A friend of his told me to blog about Philippine street food, maybe I could to that once I manage to take more photos again. I will try to update you guys regularly, I’ve been strolling the mall this past few days as I search clothes for my Boracay trip on June. I spent my Sunday with my best friend, Channa. We were busy talking to each other and we fail to take pictures together. We end up buying new clothes from Get Laud! which I will post in dishysammy soon. I said I will print my event report now and encode February posts. What you did for your mom today? Me? I gave her money to buy what she wants. I am not super close with my mom that's why. Happy Mother"s to all the mothers out there. I had my hand and feet pampered yesterday at Unan Spa. It's my new sanctuary it's five minutes away from our house and it's open until 11 PM. I am planing to get a massage later. I wrote all the January posts for dishy and I just finished the 31st so I am updating you guys. I will do the February tomorrow in the office while printing my event report cause this lappy is turned on for 72 hours already. It is now raining and I hope all of you are safe. It seems like I have been out of the cyberspace this week. I know I have pledged that I will blog more often but since I have to signal at home and I cannot use our laptop (my siblings claim they own it) I am thinking of buying my own (some time in June). I still cannot say it here but a month from now I will spill the beans. Just a thought about it makes me cry now. I am asking myself why? what? Is it time already? God Knows. People older than me that I consider sister in my corporate life is telling me to hang on, sort things out, list down the things I want. When you become so attached to something you can't let it go that easy. I am becoming very sentimental as they have become my family. Enough drama. Let's move on to my site. I am doing my best to up dishysammy as soon as possible but I still have to encode all the post (Of course the photo shoot). Once I have it available online, I will take it from there (ads, events, network). This is one of the things I wanna do and I am sure of doing for the rest of my life. Now I wanna slow it down, submit everything to God. I know he is guiding me to the right path I should follow. How's the rain getting your way so far? I am feeling cold. I have a QTT (quality time together) session later I hope no hassle will arise later. I am quite sleepy now because of the rain so why don't you guys read about my dinner last night? Click here. And let me know what you think okay? April 23 - I created this blog while building my self hosted style blog. I said that this blog would be more on relationships but I don't have any entry in my mind worth publishing. So I said to myself.... Why not make this my new personal blog? I have bought my domain in WordPress and I am too embarrass to post my rants every now and then. I feel that having less followers here I can still find my comfort in writing. Yeah that's me. I find comfort in blogging maybe because I do not have bunch of friends that will listen to me about my weird thoughts. And I do not want my boyfriend to freak out about this. What brings me to this post anyway? Well.... I got a feedback that I have used the word 'forever' wrong. "Received a message that will change my life forever. Thank you Lord. I know it's time"
That is my last night's statement. I knew that I got the perception of having a baby or settling down. I do not mean any of those. I was thinking that if you will stir your wheel a little your whole life will change. right? Every small manipulations in your actions can alter once future. It's like eating 1000 calories today with no work out will give you excess pounds tomorrow. Basically your appearance had changed as well as your vision of yourself. So you will think of something to change what you have now. I am not sure if I should divulge now but I am talking about greener pastures. I realize that when I received comments of being ugly during the last event I organized. Whoa! I feel that I do not want to face them again next year and receive worst comments if I won't act now. But is this really the world? They look at you as if their eyes is a weighing scale and say you weigh too much. I am not alone on this. I don't even know now that this is the thing that is bothering me. I just want new tasks, environment, and real world. The place I am now had been my second home or school where I have done my things my own way. I want to be controlled and be molded at the same time. I am not getting any younger (although I still young). I have a future in mind that I want to start building today. I want a new life when we move to Laguna (the date is getting nearer). Circumstances and scenarios keep playing in my head and I know I have to stop them and do something. The good news is I have my CMS working in Plesk 10 after talking to the technical support representative. I just need to do a little revisions. I hoping that I will have everyone's support on this. And I hope tomorrow's going to be a good day. Any insights? Let me know by your sincere comments below.